This year at the New York Auto Show, crown jewels were few and far between. Sure, we saw McLaren’s new supercar and Aston Martin’s track monster. We saw Cadillac’s CT6 and Jaguar’s XF sport sedans. But most of them had already made their debuts in Geneva. So I was left looking for other things that, while not necessarily new, might provide some eye candy in the interim. Naturally I felt drawn to the stand at Rolls-Royce. And found a crimson gem called the 2016 Phantom Drophead Coupe. The US$560,000 (RM2.04 million) convertible is big and heavy and bold — normally a combination that exceeds my sense of good taste. But I couldn’t deny how stunning it looked with its gunmetal grey body and baby-soft Mugello red leather splashed over everything inside. It could easily double as a royal coach. The thing feels as big as a living room, and I literally had to step up to get into it — and I am 6ft (1.83m) tall in heels. 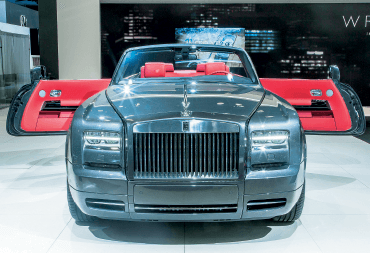 It’s meant to showcase Rolls’s popular and profitable bespoke programme, which services its owners in pretty much whatever automotive fantasy they can imagine. So this one has seat belts coloured a special shade of grenadine, with its Spirit of Ecstasy hood ornament illuminated from the bottom. The effect displays the perfect arch of her sculpted wings. Inside, it has stainless steel pinstripe detailing and stark white-faced instrument dials; outside are stylish 21in wheels. Even the doorside umbrellas are colour-coordinated with the hand-stitched interior and black lambswool carpeting. The Rolls-Royce badges inlaid in the doors light up at night, and the one on the dash is made from solid silver.